Chapter 11! Kanton Kull is getting more difficult to photograph. My sewing room is just so big to be able to stand back for the "click". 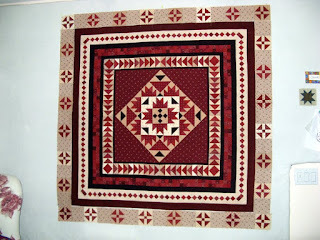 You can see that the solid border fabric has changed in this round. 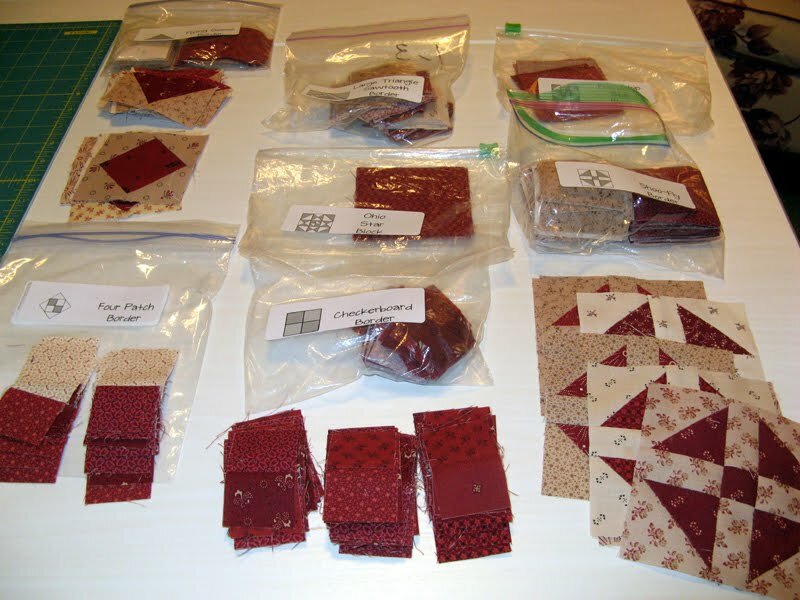 These red fabrics are just awesome. 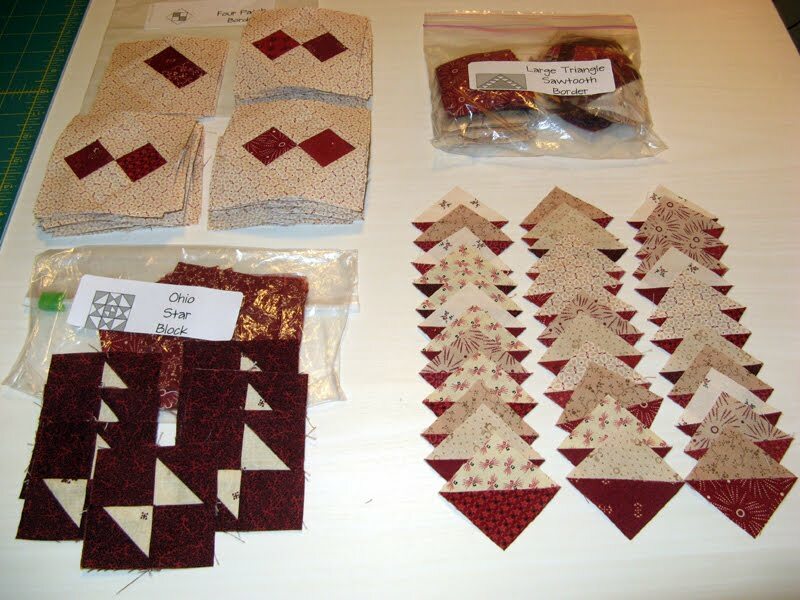 I have some units of the Ohio Star blocks to finish yet, but not too many. Looks like I am on track for a finish this week. Enjoy the rest of your week. Kanton Kull is now finished through Chapter 10. 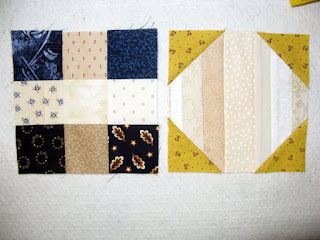 Step one of this chapter was to add the Shoo-Fly Border. I'm loving it! Many have served our country bravely so that we can have the freedom others don't have. We all can appreciate the sacrifice this takes, maybe not in all circumstances first hand. My father and brother both served for the Air Force. They wore their uniforms proudly until their retirements. Thank you for allowing me to live my life in the comfort you have and continue to provide. Today is a family Birthday Day too! Tiffany...the new bride...celebrates another wonderful year. 2017 has been a big year so far with many firsts; more to come later this year with a new home. Wishing you happiness in everything today and always. Kanton Kull finished in this photo through Chapter 9. 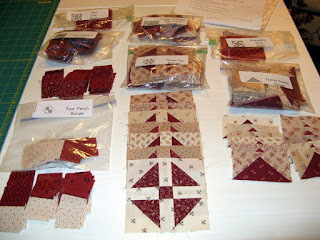 All of the units are sewn that were part of this chapter's work. Kanton Kull with its next chapter in full production. 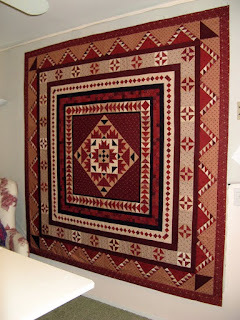 I really like the Shoo-Fly Border. 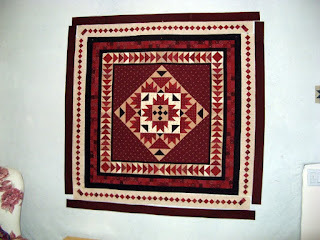 I don't have it sewn on yet, but getting very anxious to see how the next borders are looking with whole project. I'm working on the units now. Nothing to change my counts this week. 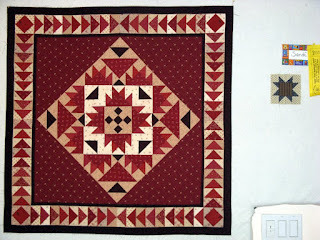 I am getting close to a finish with Kanton Kull (aka A Prairie Gathering by Pam Buda). Thank goodness we've made it to the middle of the week. All down hill from here and I certainly hope it comes quick... Monday is Memorial Day; a holiday day for me. With Friday of that week an off Friday... A very short week with many taking PTO. Next week should be an easy week. So I wanted to take time to gather all the swaps to show what lovely blocks the Aqua/Blue Swap brought each of the participants. I will be getting Mary's in the mail before the week is out. Everyone else will get their portion of the swap when next I see them. As you can see there is a lot of variety...the goal has been met! I will be sort through these tonight. I am working away on Kanton Kull. This is Chapter 9 in work. 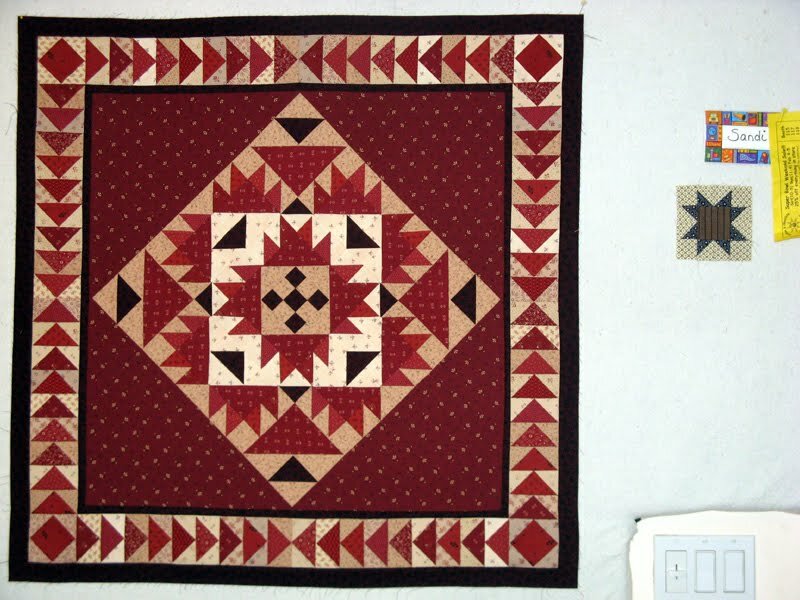 The Nine-Patch Border was this round along with stitching more of the Shoo-Fly Blocks, Large Triangle Sawtooth Border, and Friend Star Border units. Chapter 8 is nearly complete. 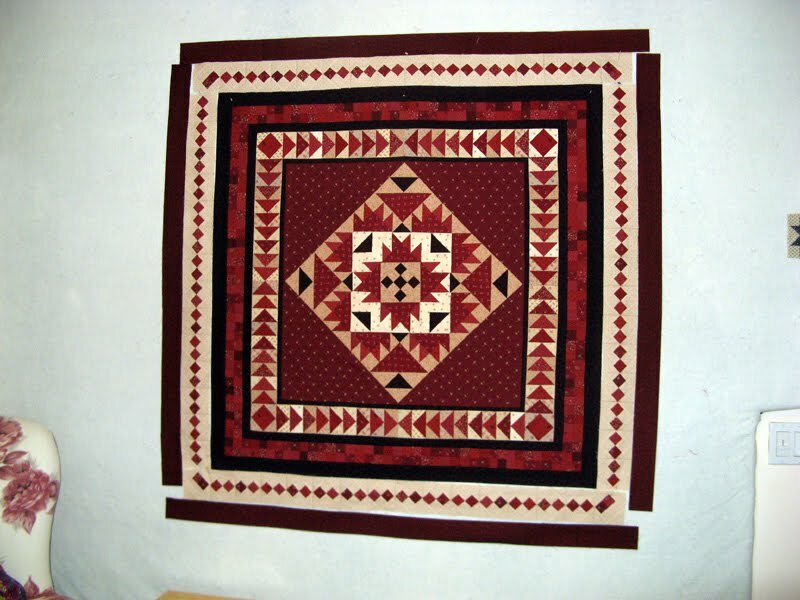 I have the dark red 2" solid border to stitch yet. 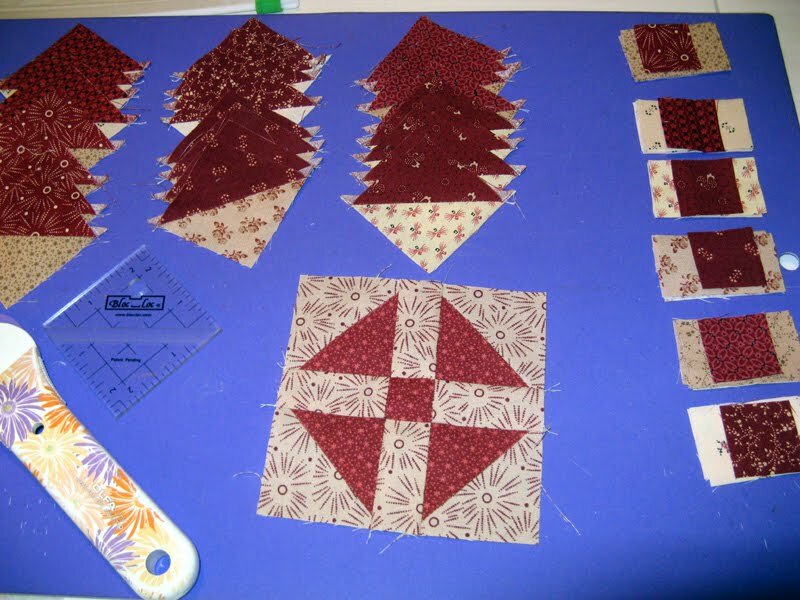 This chapter had me stitching all of the Four-Patch Border units together. It is the ones on the top left. 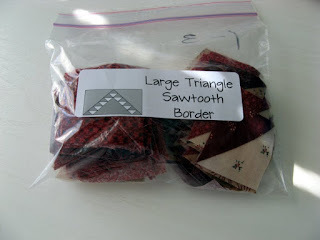 Also put together more of the unis for the Large Triangle Sawtooth Border...with many still yet to go in chapters to come yet. Finally the first time touching Ohio Star block. These first units are for the Odds & Ends units. Above is Debra's blocks. 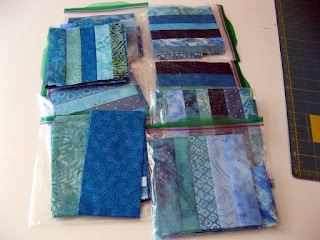 Good to get more on the light side of the aqua and blue. 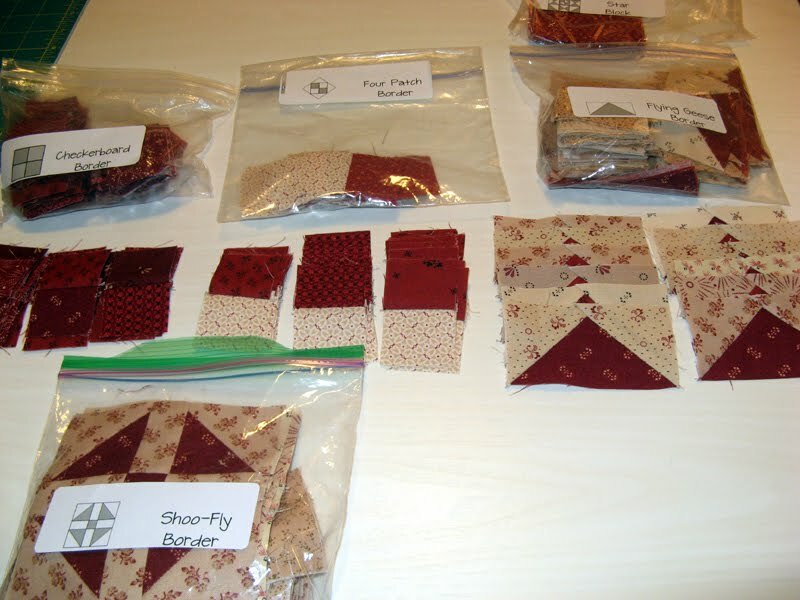 Without a lot of checking I have only noticed a couple of fabrics repeated between the participants. These are from Debbie. Her DH was nice enough to get them to me on the due date. 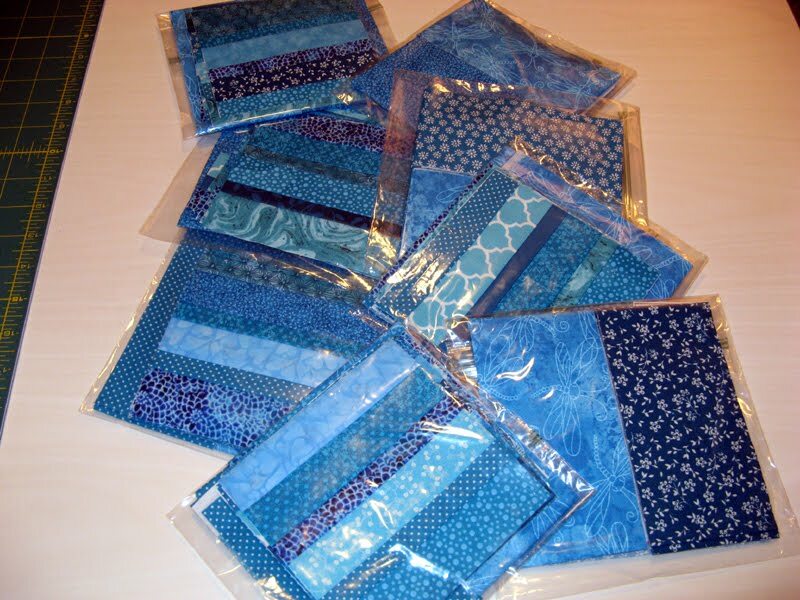 Debbie's have a great batik in the strips in my opinion! Today I am working on Chapter 8. 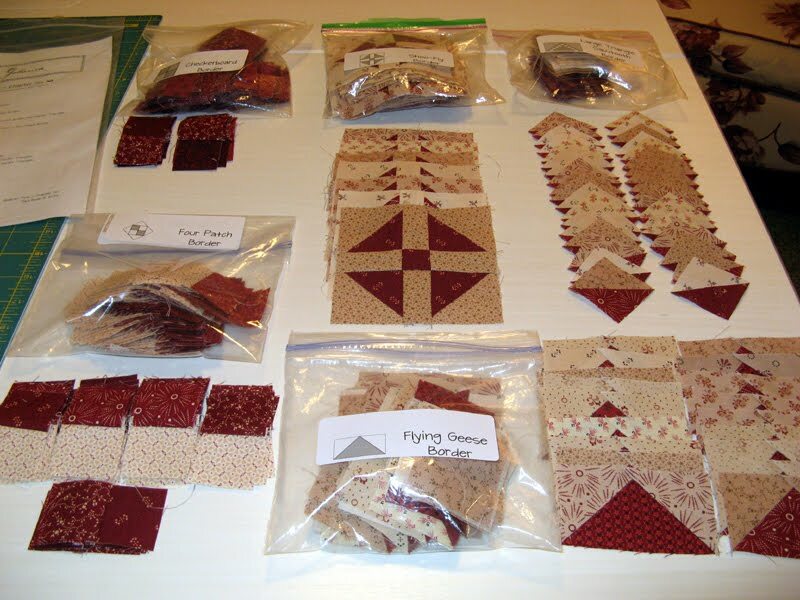 There is a lot of sewing in this chapter of Pam Buda's A Prairie Gathering. For those new here my project is called Kanton Kull. The Checkerboard Border was the first to finish. 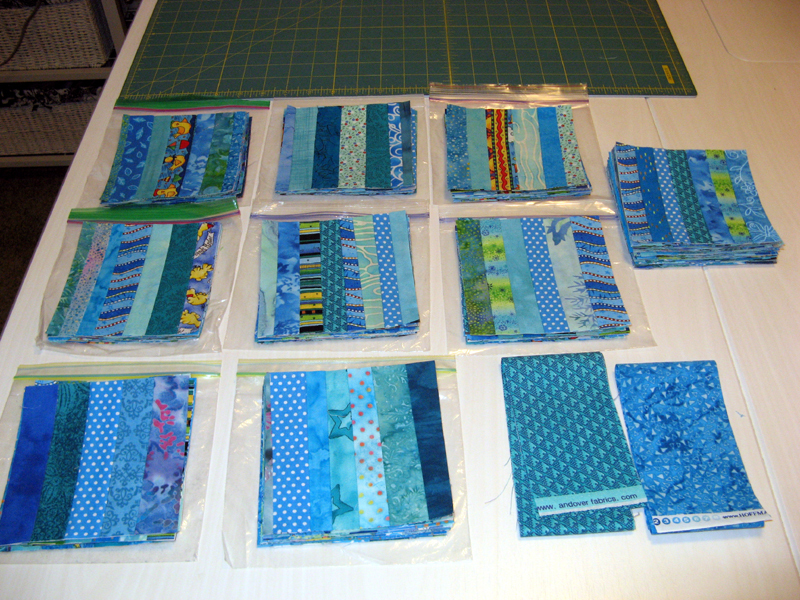 This photo has the two sides and the top and bottom units sewn together, but not yet attached. I need to iron first. It is measuring up just fine with the rest of the project YIPPEE! Next to sew were all the Four-Patch Border pieces. The units on the left are the corners. 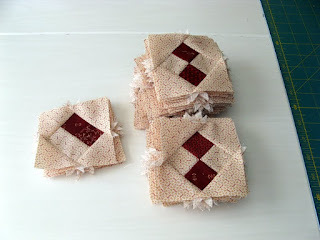 Next for these is a press and trim. The Large Triangle Sawtooth Border units are next in line and then the beginning of stitches on the Ohio Star Border. I will be working on this chapter probably through the beginning of the week. Both Teresa and Jennifer had their swap blocks to me this weekend. Jennifer tucked in her package some thought filled goodies. 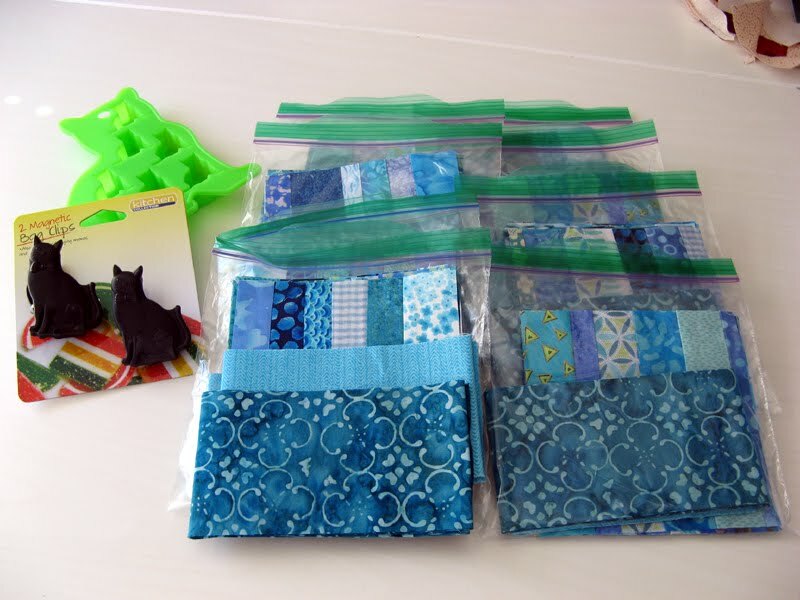 The green kitty is for making kitty shaped ice cubes...too funny! 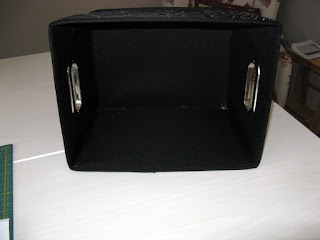 The black kitties are chip closure clips which will definitely be put to use. Nothing changed my fabric stats this past week. Kanton Kull is coming close to changing my used category... Join me tomorrow for more on Kanton Kull and the revealing of the last two swappers blocks. Here are the other units that were part of Chapter 7. 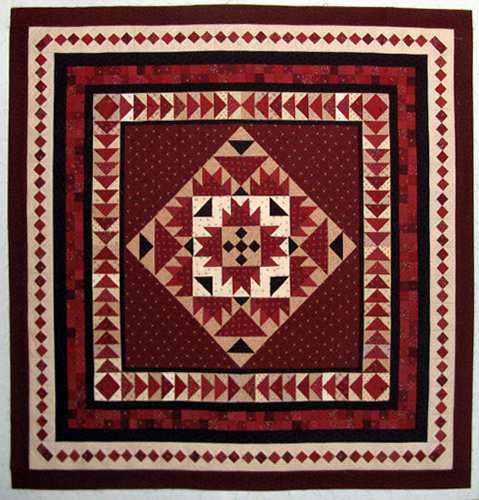 Checkerboard Border, Four-Patch Border, and Large Triangle Sawtooth Border units were stitched. Several more chapters to go still. I am making significant progress though. Quarter three will have me adding the Checkerboard and Four-Patch Borders. The mail carrier brought me Kerry's Aqua/Blue Swap blocks today. Just days away now from the turn in deadline...a few more yet to be received...will they make it? Sorry for the glare on Kerry's blocks. 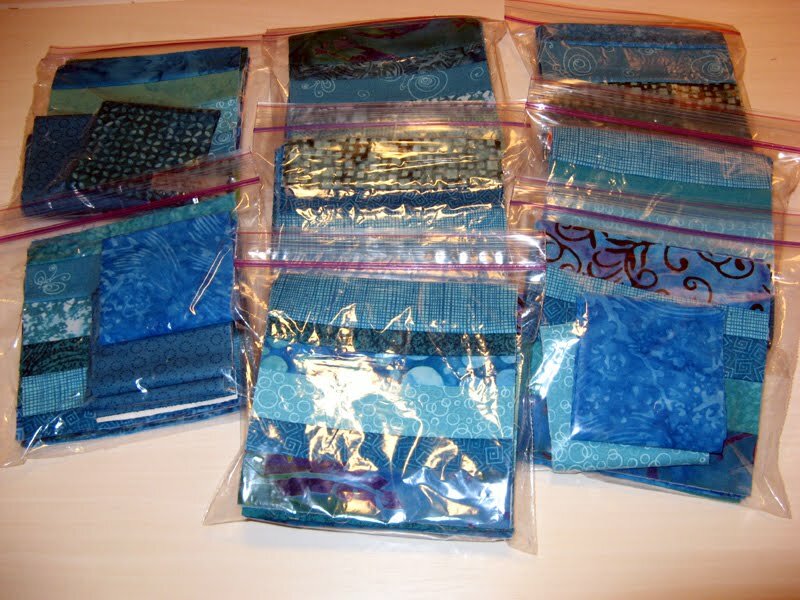 There are some fabulous fabrics in these units. It will be hard for me to select a favorite! These are what came on Wednesday from Joan. I have my eyes on the block with the wavy stripe strip to be mine. 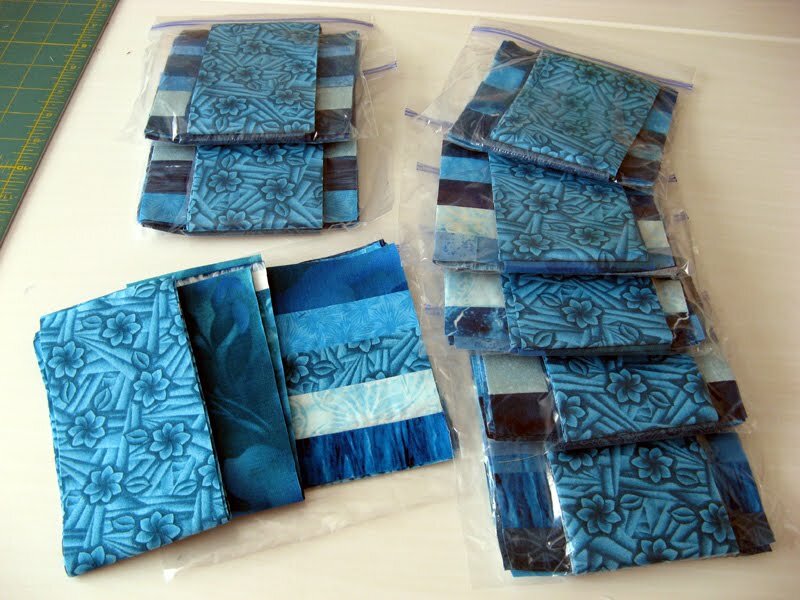 I also like the aqua musical notes and the dots and the flowers and the ... Can you tell I like Joan's fabrics? 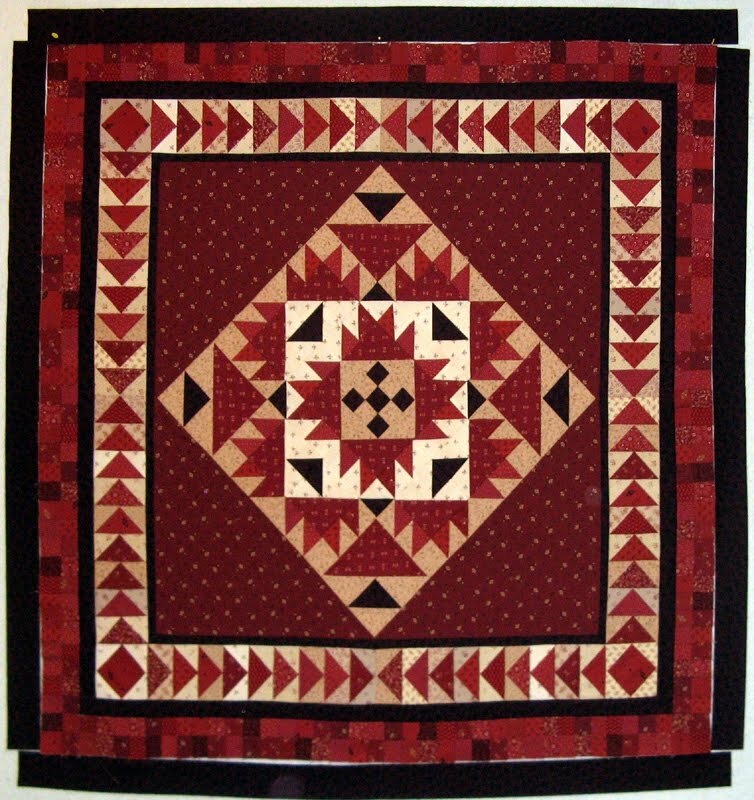 Chapter 6 is complete for Kanton Kull (aka A Prairie Gathering by Pam Buda). 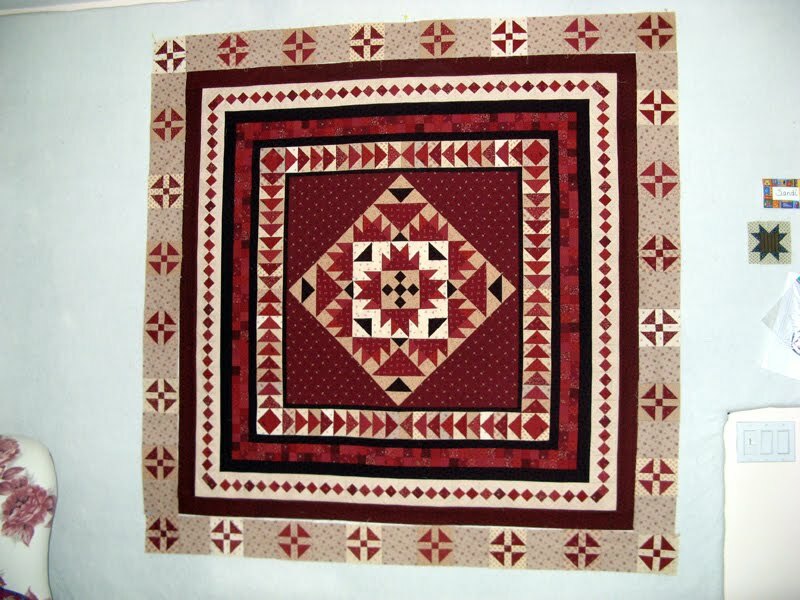 This chapter called for sewing more units for the Flying Geese Border, Checkerboard Border, Four-Patch Border, Shoo-Fly Block Border, and the first stitching of the Large Triangle Sawtooth Border. My favorite still has to be the Shoo-Fly Block Border. The cutting started for Chapter 7 last night. Not too much to cut this chapter. Today is a day off for me. 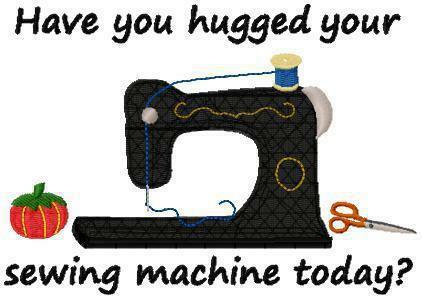 Looking forward to enjoying my sewing room! 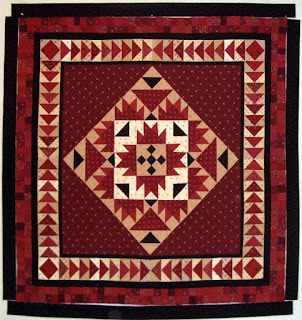 Chapter 5 is complete for Kanton Kull (aka A Prairie Gathering by Pam Buda). 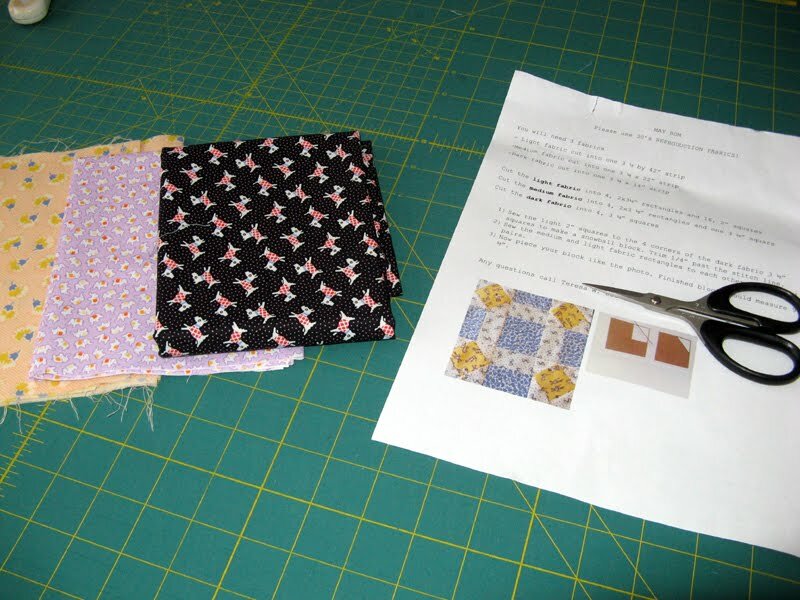 This chapter called for sewing more units for the Flying Geese Border, Checkerboard Border, Four-Patch Border, and the Shoo-Fly Block Border. My favorite has to be the Shoo-Fly Block Border. The cutting has started for Chapter 6. 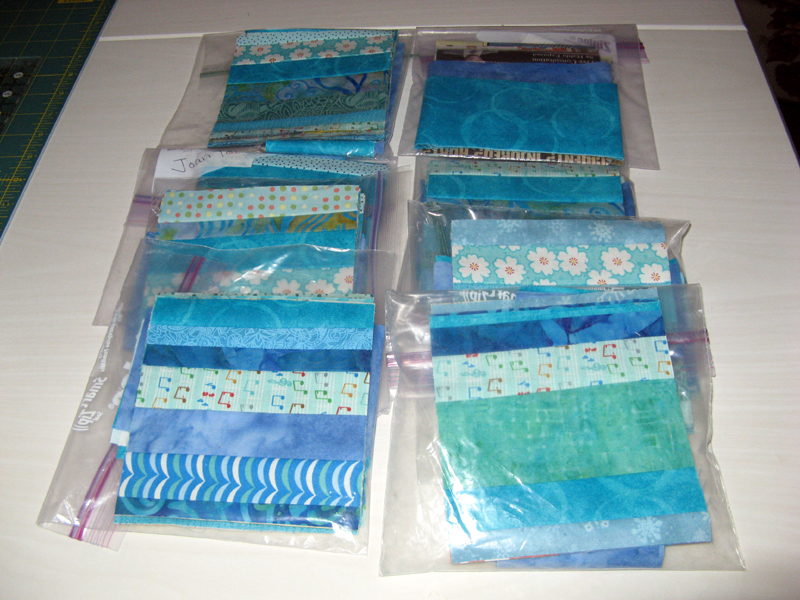 The mail brought me the second turn in of Aqua/Blue Swap Blocks from Mary. Aren't these great colors? DH is off to a Padres Baseball game tonight with his long time friend Lindsay. These two haven't spent time together in years. 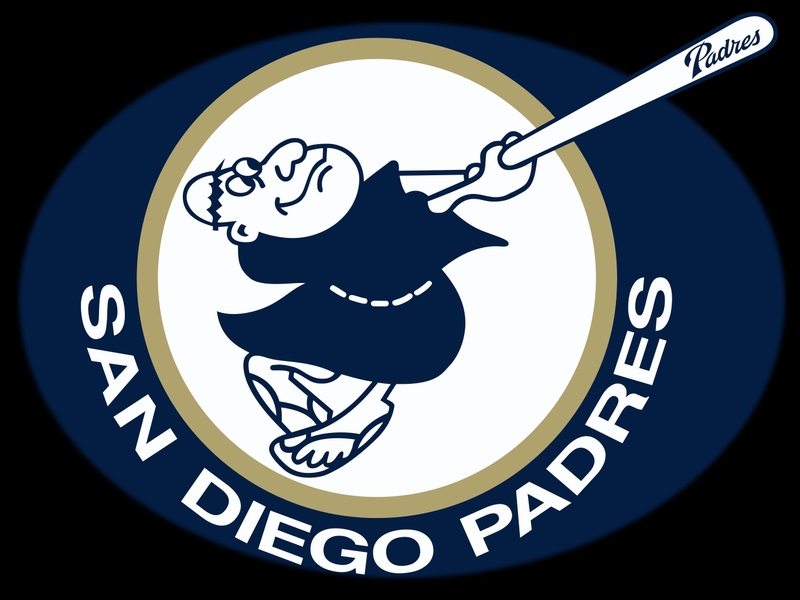 I hope the Padres give them a good reason to do it again more often. Have a terrific Wednesday. Don't you just love seeing the end of your scraps box? Mine has been full for a long time...until this weekend! Started working on managing all the bits and pieces on Saturday and the final 2" size was done at 11am. Now I really need to find some scrappy designs. 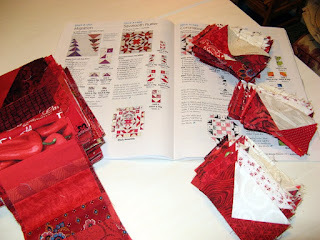 I have been itching to put together the new project Bonnie Hunter introduced us to recently. It doesn't have a name that I heard yet. It involves horizontal string blocks that becomes snowball blocks. This is probably what drove me to manage the scraps. I like the blocks. I have no idea how to set them or for that matter how many will be needed. I'll just make until the scraps run out...perhaps I should rethink that! 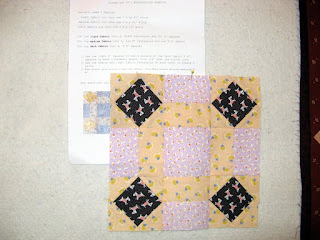 Next up for sewing on Sunday was Sunshine Quilt Guilds monthly BOM. I had to dig real deep to find the 30s fabrics. 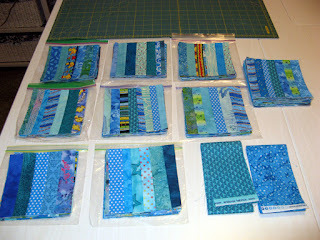 If there had been one more fabric needed I would have had to take a trip to Rosie's. I did settle on the three fabrics. Then I bit off most of Chapter 5, Kanton Kull (aka A Prairie Gathering). I have most of the parts done with only the Shoo-Fly block to finish. The units have to finish with their given size or putting the project together will be tough. My trusty BlocLoc Ruler to the rescue. I hope this week is excellent for you. I will be stitching during Dancing With The Stars tonight. 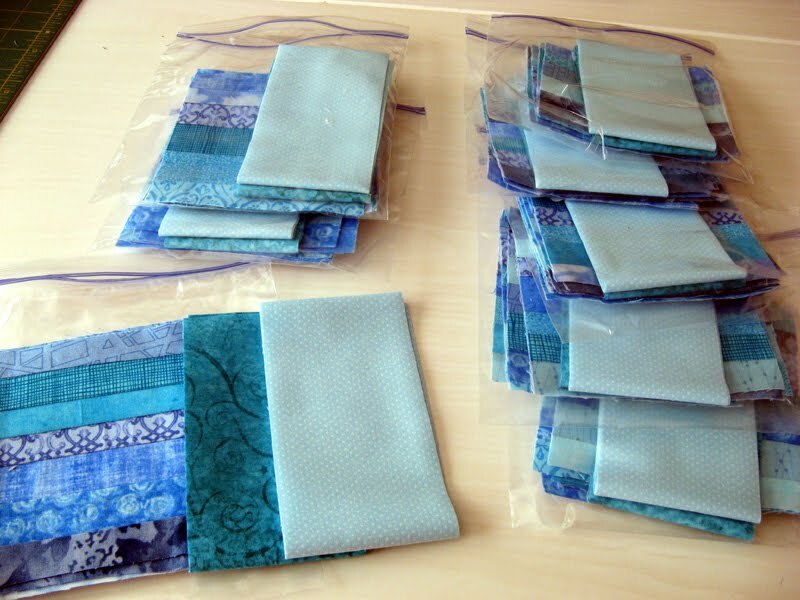 The ShooFly will be done then off to cutting Chapter 6. 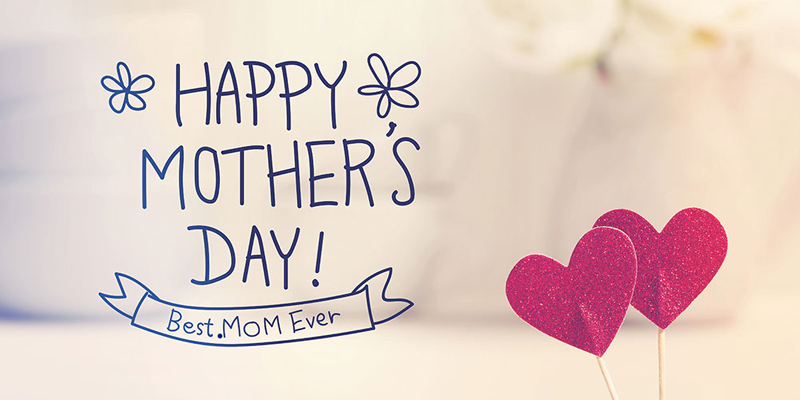 Today has been postponed until June 11th when my Mother's Day celebration will take place. That's also a Sunday and there will be a brunch to be had! Sure would be nice to celebrate all the holidays and special days with family, but being 3,000 miles away does make it difficult. There are plans for a telephone call! 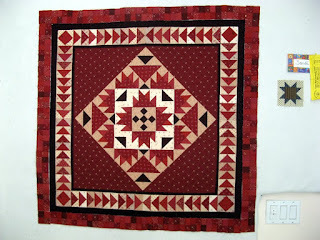 Kanton Kull (aka A Prairie Gathering by Pam Buda) Chapter 4 is finished. Chapter 4 had me cutting and stitching. I stitched parts of the Flying Geese, Checkerboard, Four Patch and the Shoo-Fly Block Borders. 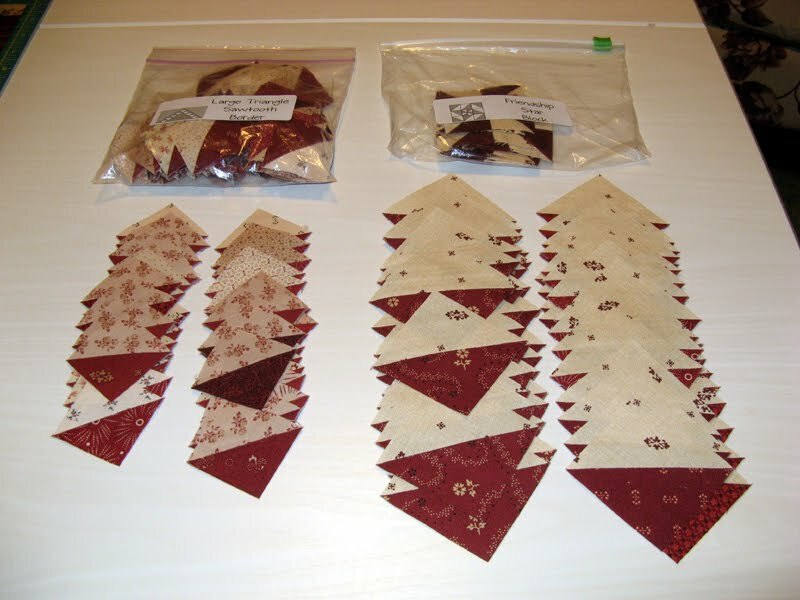 The Large Triangle Sawtooth, Friendship and Ohio Star pieces were cut and added to the baggies during this chapter. I have Chapter 5 all cut. Stitching started on Thursday evening. 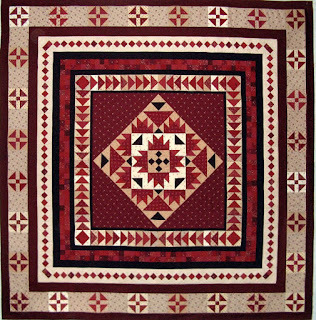 Quarter Two will get me through the Flying Geese and the Checkerboard Borders with solid dark red strips in between these borders. Anxious to get through this Quarter and on to the next. I did prepare the binding for Kalvery, but have not yet started the hand stitching. Need to have a sunny day since navy on navy will be difficult stitching. Again nothing to report used or purchased this week. Looking forward to a change...these stats have been stagnant for far too long! 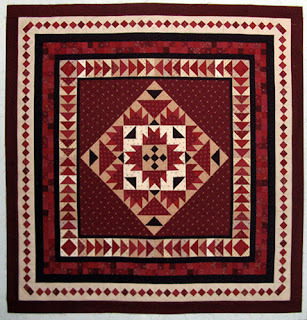 See more quilters moving their Stash Stats through the links at Patchwork Times. 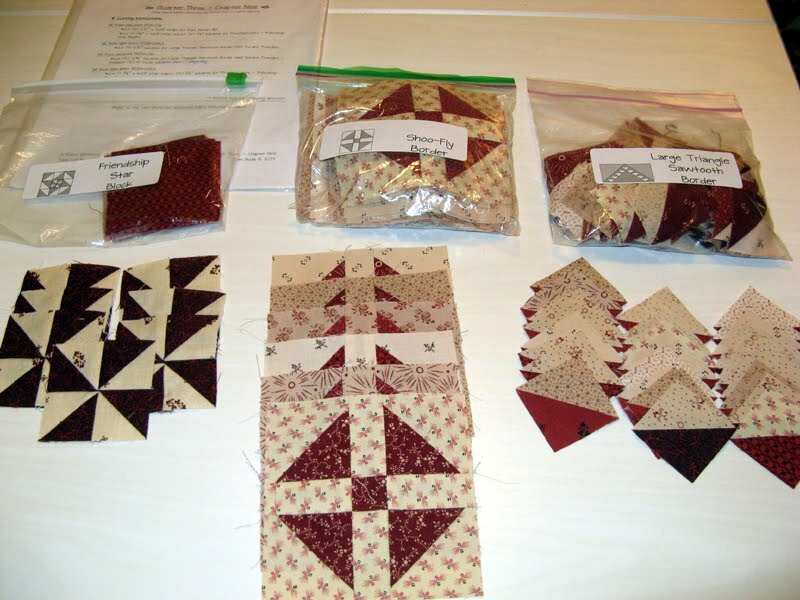 Tuesday evening was Sunshine Quilt Guild's monthly meeting for May. I was one of three lucky winners of a door prize for having my name tag. I have made Country Threads patterns before and was happy to have two more chances. 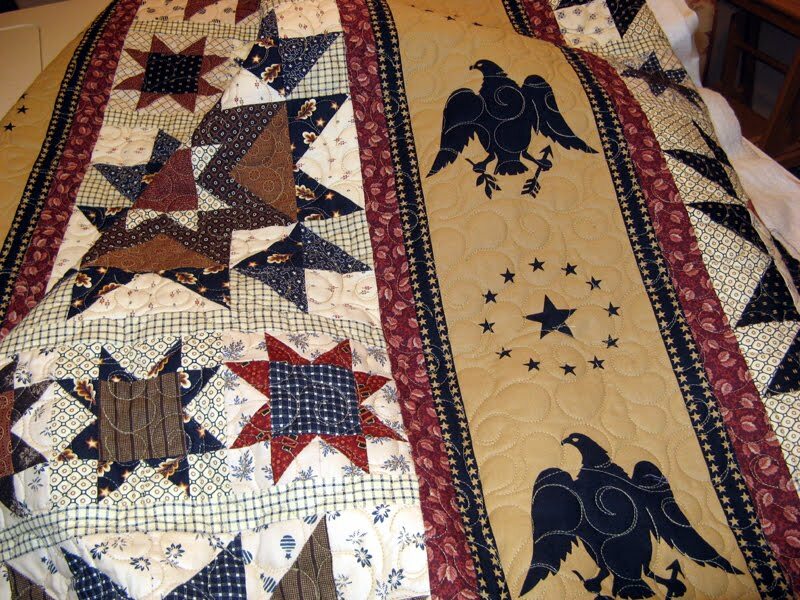 Notice the pattern on the left has a cat on it? 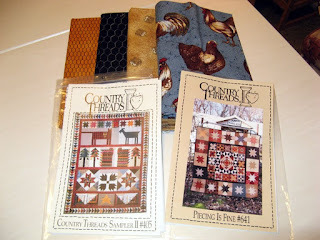 Not sure how the chicken fabrics will play into my projects, but I like each of them nonetheless. Before the meeting I made a stop at Joann's for the 100 Blocks Quiltmaker Volume 15 magazine. You know I would be utmost interested in the entry from Bonnie Hunter. Well I was not disappointed with Sawtooth Flutter. Funny in reading her blog she did not exactly like the name. It was as a result of her having a same name block from another block entry. Bonnie was holding a contest to come up with a new name. I frankly like the one hers was coined. Funny she envisioned a butterfly with teeth in Sawtooth Flutter! 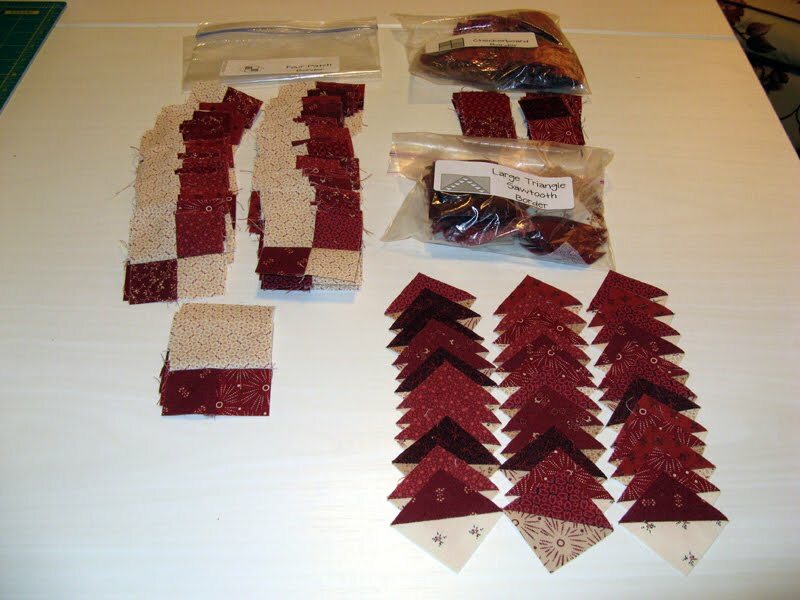 Anyway with leftover flying geese from Talkin' Turkey, made some time ago, there are leftovers that will be used to make this one...and just in case the layout involves red strings...I am covered. The first Aqua/Blue Swap blocks are in my hands from Bonnie Sue. She is always so sweet to give me a little thank you for coordinating swaps. 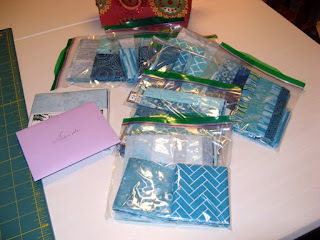 Know Bonnie Sue that I appreciate this treat and look forward to using the "thoughtful to the fabrics of this swap" charm pack in my project. There are still many units to be made that this swap is built around (Straights of Mackinac). The due date for the remaining swappers is May 22nd. Tuesday evening was indeed a night of getting goodies. 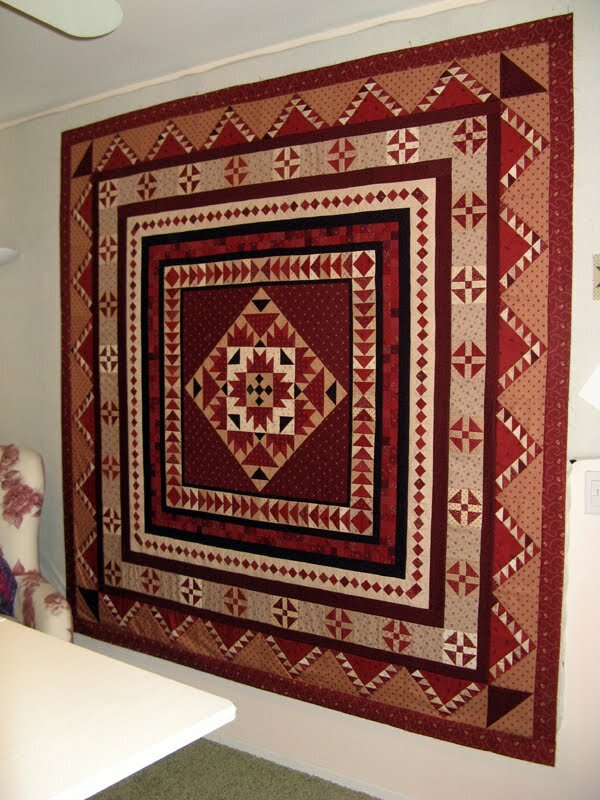 Kerry brought me Kalvery "quilt" finished. 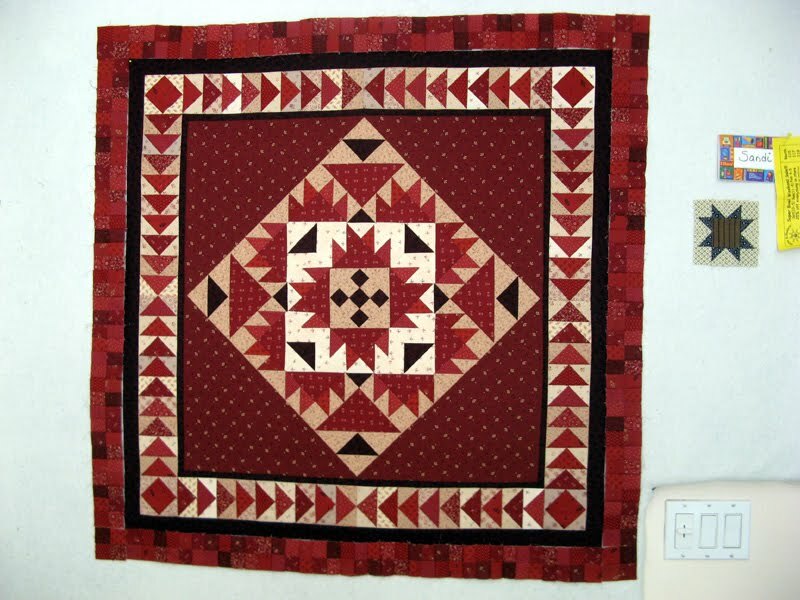 An awesome feather design (HA Twirly Feathers) was quilted that seemed appropriate for this reproduction project. I have been considering the binding fabric at the moment, but found time to trim it down last night. 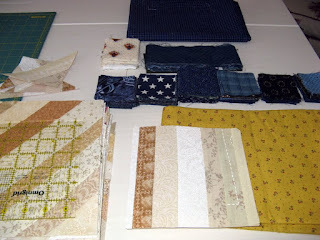 Pam Buda suggested a brown stripe Freedom Rings fabric, but I am not feeling it...brown stripe against a navy star wreath fabric that is the 7" outer border... 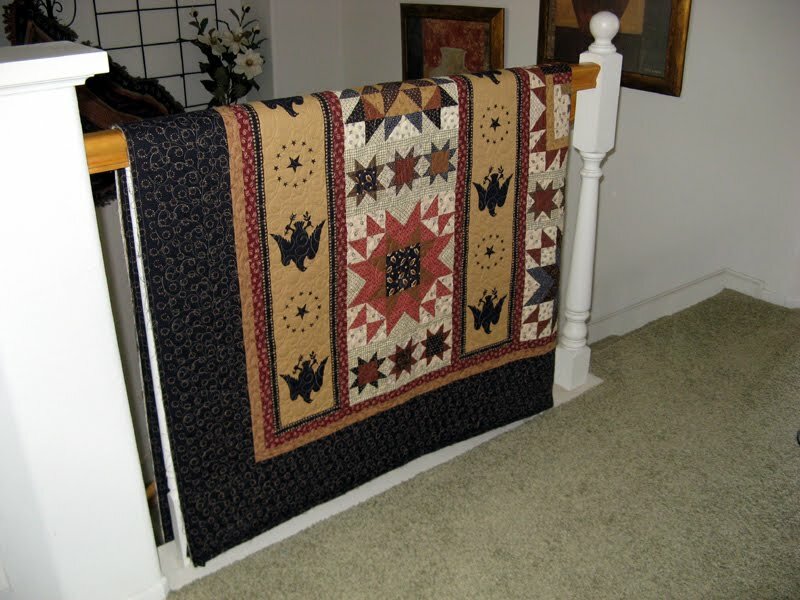 I am thinking strongly of sticking with the outer border fabric of which there is plenty. I am totally happy tomorrow is Friday! It has been a busy work week catching up from my few days off. I am looking forward to a day sleeping in and enjoy doing what I like best the rest of the day...stitching!